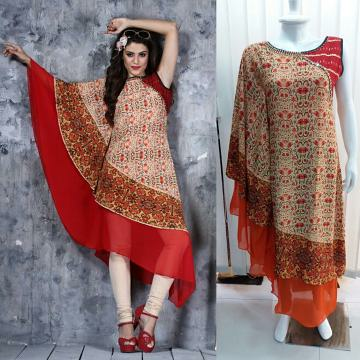 Stylish indo-western kurti/dress in flared crape and georgette material. Beautifully embellished with bead work on neck. Pair it with your favorite legging for a glamorous look. This item in Indian Kurtis & Tunics category was first added to our catalog on 06-07-2017. Buy One Side Kaftan Style Indo-western Ladies Long Kurti Dress - XL, sold & shipped by Mantra Kreations where you can shop online for Discounted Clothing - Kurtis, Suits & Sarees for Women. This Kurtis & Tunics collection has been tagged as Indo Western, Kurti, Designer, Ethnic, Glamorous, Dress, Ladies Top Tunic.